Tibet, known as the Land of Snows, is a country of immense natural beauty. The landscape is intrinsically linked to the lives of holy enlightened beings and imbued with the mystique of powerful mountain gods and goddesses. There are many places of power and natural beauty in the country and one such place is Yamdrok Yumtso Lake. Yamdrok Yumtso is a freshwater lake that lies around 90 kilometres to the east of Gyantse and 100 kilometres southwest of Lhasa. 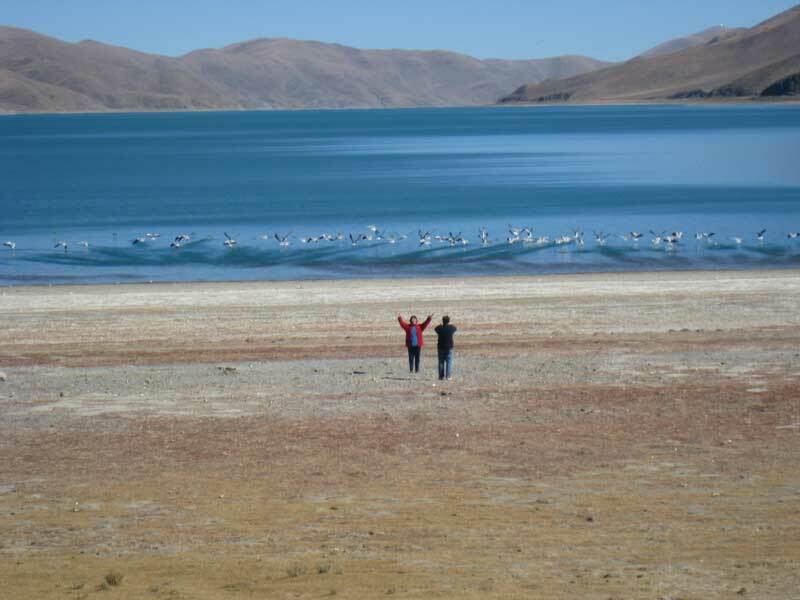 The largest lake in all of southern Tibet, it is roughly 638 kilometres2 and its average depth is about 30 metres, although it can reach 60 metres at its deepest. Its waters are a deep turquoise which is where it gets its name — roughly translated as ‘Turquoise Lake of the Upper Pasture‘ — and is fed by numerous streams from the surrounding snow-capped mountains. 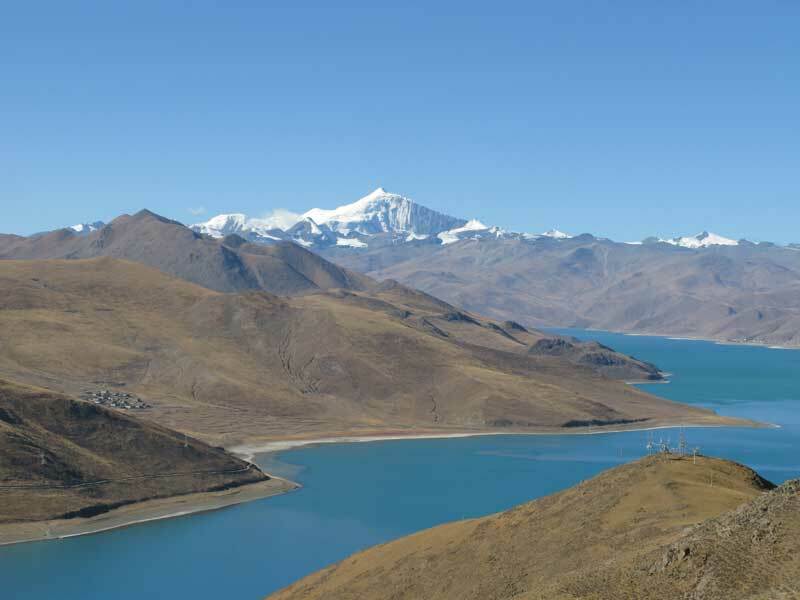 Yamdrok Yumtso is considered to be one of the four largest sacred lakes of Tibet, the other three being Lhamo La Tso, Namtso and Manasarovar. 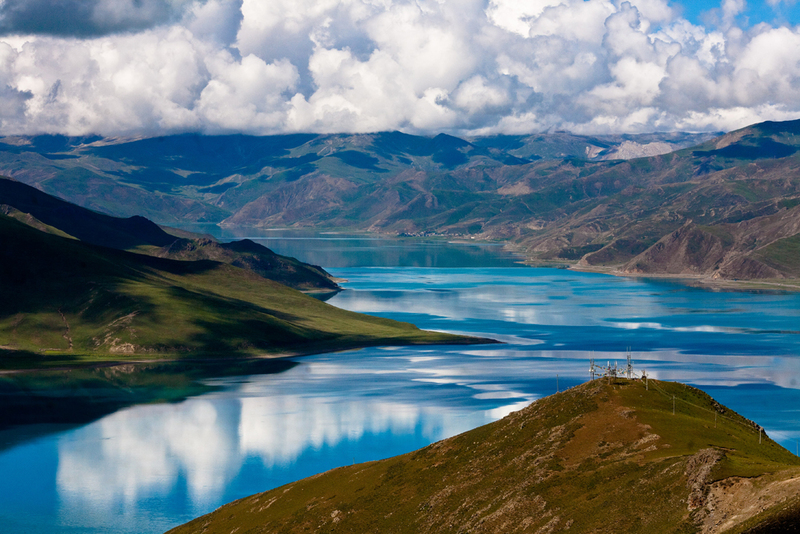 According to local legend, the lake is the physical manifestation of the goddess known as Dorje Geg Kyi Tso. The landscape of Tibet is sacred to the Tibetan people. Just as how mountains are believed to be the homes of gods and goddesses, so are Tibet’s great lakes. As they are considered the earthly abodes of powerful protective deities, Tibet’s lakes are intrinsically invested with spiritual power. Yamdrok Yumtso is one such lake and is believed to have the power to grant divinatory visions to those who meditate upon her serene yet supernatural waters. 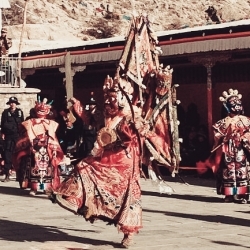 Local villagers and high lamas alike make the pilgrimage to her shores, and they can be seen walking along the lake’s shores in prayer. To complete a circumambulation of the lake within seven days is said to purify tremendous amounts of negative karma. Her waters are said to have powerful properties, which include healing diseases, granting long-life and increasing one’s intellect. The lake is so revered that it is said if her waters dry up, the entire land of Tibet will no longer be habitable for humans. 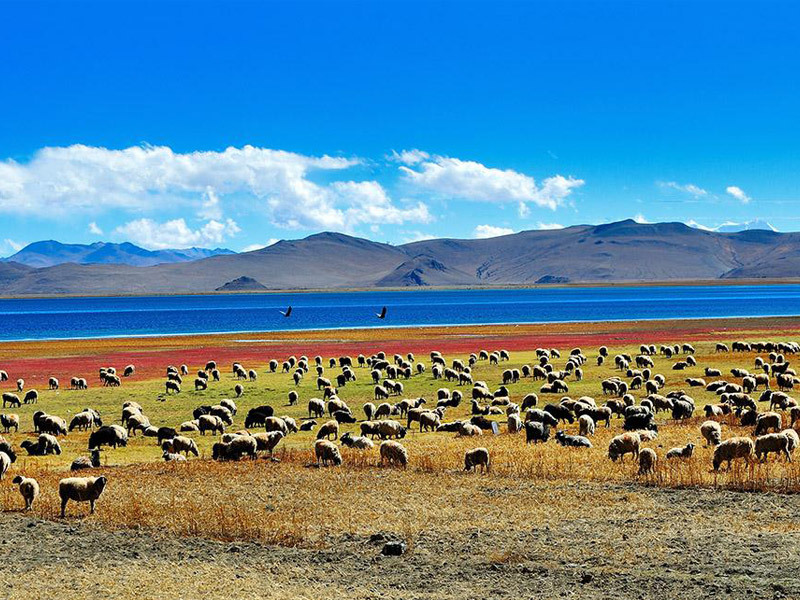 Together with Lhamo La Tso, it is one of two lakes which are said to provide visions that can help locate the reincarnations of high lamas. According to tradition, an appointed search party will travel to the lake to engage in lengthy prayers. Throwing a khata, a Tibetan silk scarf, into the waters along with other ritual objects and medicines, one of the party then has visions. 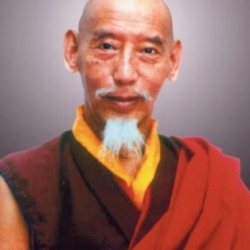 When correctly interpreted, these visions can lead to the successful recognition of a high lama’s reincarnation. 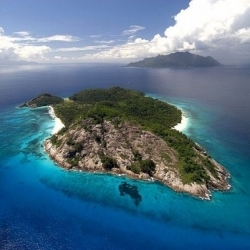 The lake and its islands are closely associated with Guru Rinpoche or Padmasambhava, the great 8th century Indian mahasiddha who was invited to Tibet to tame the local deities that hindered the spread of Buddhism in the country. 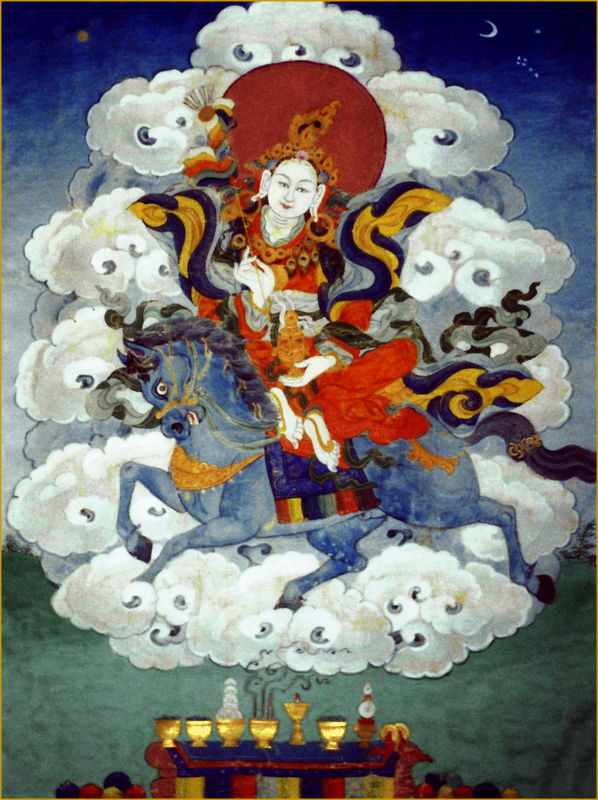 Dorje Geg Kyi Tso, the goddess of Yamdrok Yumtso, is part of a group of such deities known as the Tenma Chunyi, who opposed the growth of Buddhism in Tibet. Dorje Geg Kyi Tso. Click on image to enlarge. Legend has it that Dorje Geg Kyi Tso, a celestial maiden from the heavenly realms descended and took on the form of Yamdrok Yumtso. 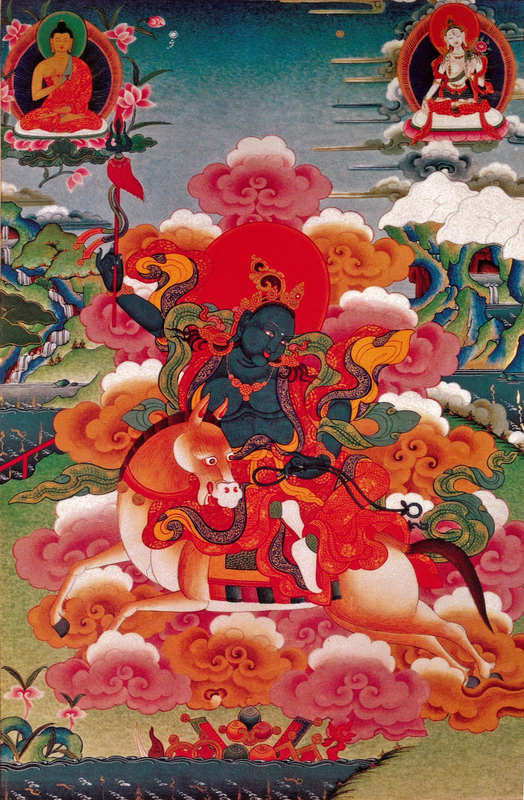 She first appeared as nine separate lakes but Yeshe Tsogyal, the consort of Guru Rinpoche, became anxious about the lives of creatures who came to live in Yamdrok Yumtso’s waters. If the nine lakes dried up, the creatures would perish. Throwing gold into the air as an offering to all the Buddhas, making auspicious prayers and reciting sacred mantras, Yeshe Tsogyal was able to combine the lakes into one unified whole. The lake formed into the shape of one of Guru Rinpoche’s many ritual implements, an iron scorpion; hence many places around the basin of the lake include the word ‘scorpion’. At the heart of this scorpion shape is a small island with a Nyingma temple that was built in the 16th century. It is famous for a handprint left in a nearby rock by Guru Rinpoche himself. However, before Dorje Geg Kyi Tso was combined into one lake by Yeshe Tsogyal, she was bound under oath by Guru Rinpoche to never harm sentient beings and to protect those who are virtuous. In fact, she was not the only being to be bound by Guru Rinpoche in this manner. Another depiction of the Goddess Dorje Geg Kyi Tso. Click on image to enlarge. Guru Rinpoche was first invited to Tibet by King Trisong Detsen. 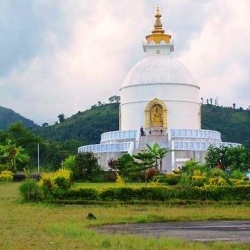 At the time, the king had invited the great abbot of Nalanda named Santarakshita to build Tibet’s first monastery (Samye Monastery) and establish the order of Buddhist Sangha in the country. However, Santarakshita’s efforts were plagued by the local deities and powerful spirits such as Nechung, who were against Buddhism’s arrival. If the local populace became Buddhists, these deities would lose their human followers. 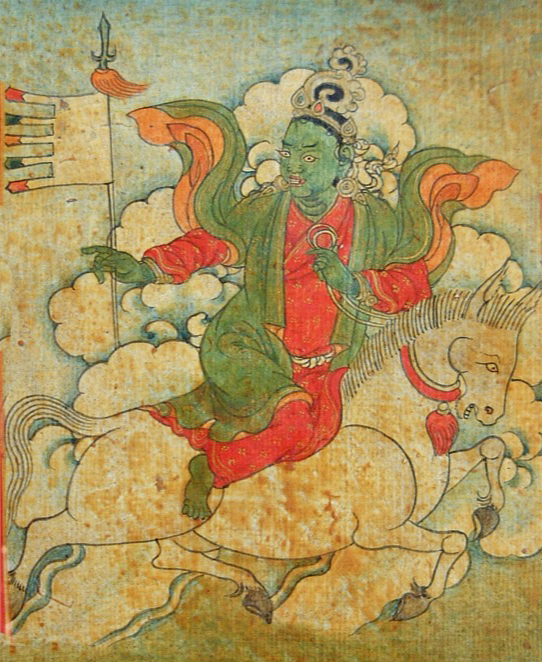 Being unable to subdue the local deities himself, Santarakshita advised King Trisong Detsen to invite the renowned Tantric master Guru Rinpoche to Tibet. Accepting the invitation, Guru Rinpoche readied himself for the coming spiritual warfare by entering powerful retreats. 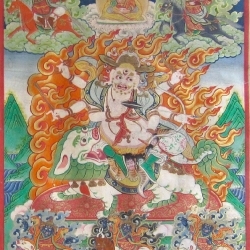 While he was in retreat at Asura Cave in present-day Pharping in Nepal, the Tenma Chunyi or the Twelve Tenma Goddesses, of which Dorje Geg Kyi Tso is one, advanced to attack the great tantric master using supernatural powers. 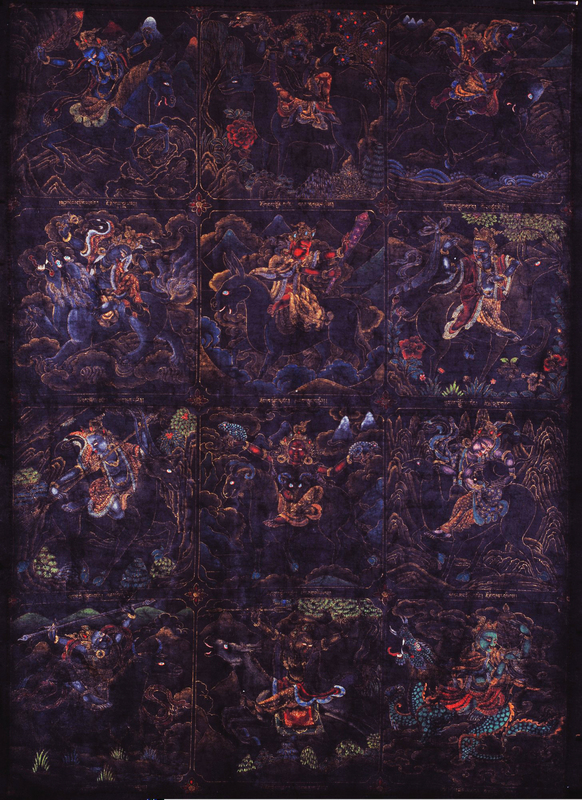 A painting of the 12 tenma goddesses. The main deity depicted here is the Goddess Yudronma. Click on image to enlarge. An extraordinary battle ensued, and the Tenma Chunyi ended up offering their hearts to Guru Rinpoche, who bound them under oath never to harm again, but to aid practitioners instead. When Guru Rinpoche asked them why they so easily accepted defeat, they replied that their job had been to protect the land of Tibet. But when they fought against him and lost, the only precious thing they possessed were their hearts, so they gladly offered their hearts to him and took him as their guru. Over time, the Tenma Chunyi were incorporated into the retinue of Palden Lhamo, the protectress form of the Buddha Saraswati. They are often labelled the ‘Twelve Mother and Sister Tenma’ because they are said to take care of practitioners like mothers and older sisters, such is their devotion towards their guru. Each of the twelve goddesses is said to be accompanied by hundreds of thousands of female assistants, from lower goddesses to spirits and other classes of beings. The appearance and iconography of each goddess varies greatly between traditions and even within various prayers to the protectors. Dorje Geg Kyi Tso is no different, and appears in five different manifestations. A line drawing of Dorje Gegkyi Tso from a-artemyeva.ru. In her first manifestation, she is said to have been born in Jang Drok Na Gye and was the sister of the god Drog Je. In this form, her body is black and she wears dark clothes. She wields a five-pronged weapon and is draped with a coat made from thousands of black bull skins. Her skirt is made from the wings of garudas. In her second manifestation, she wields a phurba dagger made of iron and rides a yellow doe. In this form, she is surrounded by an entourage of seven Sa Dak or Earth Lords. In her third manifestation, she wears a thick woollen green cloak and holds a lasso. At times, she wields a five-pronged spear and at others, a staff. 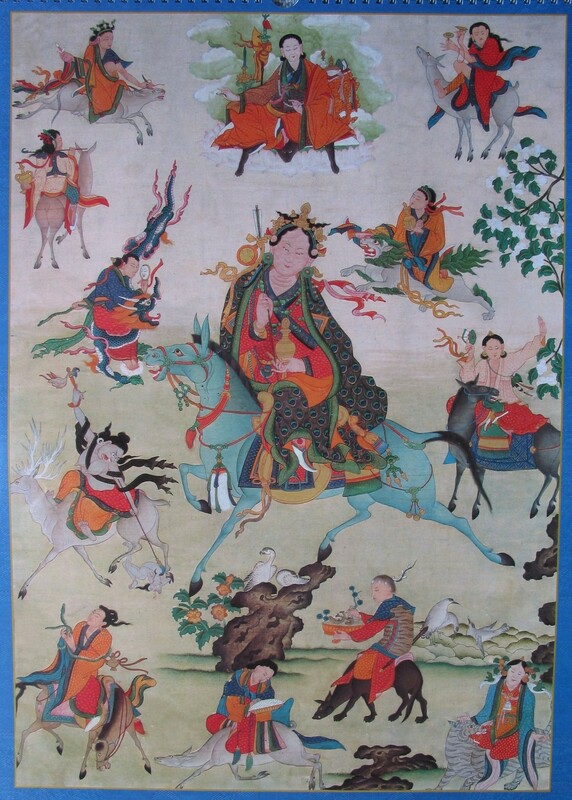 She rides a mule from Kham, Tibet and is said to be able to move entire worlds. In her fourth manifestation, she appears with a very dark red body. She wears brilliant white clothes embroidered with beautiful turquoise designs and rides a wild yak. She is surrounded by 100,000 servants. Another depiction of the 12 tenma goddesses. Click on image to enlarge. In her fifth manifestation, she wears the wet skins of yaks. She has iron-like hair which is plaited and tied in a topknot. She rides a young yak that has a white mouth, and has an entourage of many great nomads, which is where she gets her epithet – the Tamer of the Hordes of the Vast Pastures. Her main function is to remove obstacles in all their forms from the paths of spiritual practitioners. This includes obstacles created by people trying to cause harm, especially when this harm is caused by supernatural means. 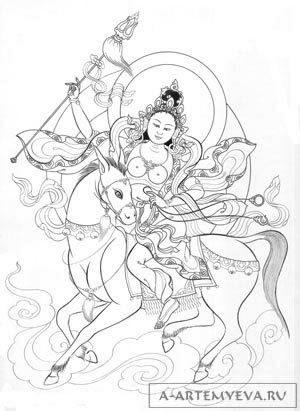 It is said that by propitiating just one of the Tenma Chunyi, such as Dorje Geg Kyi Tso, one is protected and aided by all twelve goddesses, who are fast and effective in providing practitioners with help. When you pray to one of them, you create the causes to be connected with all of them. 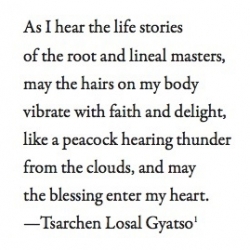 Below is the praise and mantra of the goddess Dorje Geg Kyi Tso. While she is not an enlightened being, therefore we do not take refuge in her, she can still provide practitioners with the help they need to overcome obstacles and advance along their spiritual path. We take refuge in Shakyamuni Buddha always and with this, we can invoke her help if we like, as she is promised to help practitioners. She is benevolent. She is sworn to help practitioners therefore she can be a helpful friend. Her praise and mantra can be recited safely as she has vowed to Guru Rinpoche never to harm people. To you and your retinue, I sincerely prostrate. Information on unenlightened Dharma protectors has been provided here for educational purposes. We are often asked questions about unenlightened Dharma protectors and so wanted to share this information so that it is easily available for those that are interested. However, please remember that when you rely on unenlightened beings, they can cause you harm even though they are bound by oath. As they are not enlightened, their clairvoyance is limited. They can see that if you do a certain action now that it will work out well, and they have foresight into the future. However, this foresight is limited. For example, they can only see 10 years into the future, and for those 10 years they see that the action will be good. However, if you do as they advised, after 15 years perhaps this action will harm you. They did not know that it would harm you because they have limited abilities. So their harm is unintentional due to their limitations. They may indeed be bound by high lamas, or their minds have been tamed, but you can still be harmed. Another way to look at this is if you rely on a fitness trainer who is not an expert, you can hurt your body, but this harm was unintentional. It is not like they were out to hurt you or not, but if you ask for their help, they will try to help you to the best of their ability. For example, if you ask a 10-year-old child if there is harm living near a radioactive building, they will not know and think there is nothing wrong. So, if you live near such a building, based on the advice of a 10-year-old child, you can potentially end up being very sick. The child did not want to harm you at all and did not think that the advice they gave was wrong because the child did not know. It was beyond their capabilities. However, if you asked a doctor he/she would have told you not to live there because it was dangerous. On the other hand, enlightened protectors, whether in enlightened forms or worldly forms, have full omniscience and therefore have complete clairvoyance. They have no obstructions to see all happenings (phenomena) in the past, present and future, so can give us perfect advice. The purpose of providing these prayers here are because there are thousands of people worshipping these deities and they are benevolent. However, one needs to understand how to worship them safely. After all, it was not us who created their deities. But since people do ask us about such deities, we take the time, energy, care and concern to write about them. You can ask unenlightened beings to help you, just like you would ask a friend to help you but you cannot rely on them as a Buddha. For this, you should rely on Buddha Shakyamuni and take refuge in him. Following his teachings, you can reach the enlightened state. For ordinary day to day help such as finding a job, having enough resources, and other such actions, you can ask oath-bound unenlightened deities for help without taking refuge in them. That is the key to practicing these deities. See What’s inside Our Statues!! Since becoming a Buddhist, Niral has had a voracious passion for the Dharma. He is known to have his head buried in books and loves to share what he knows. Niral has now found a better way to share his weird, whacky and, more often than not, other-worldly ideas with an unsuspecting audience - as a guest author on his Guruji's blog! All enlightened beings are worthy of homage and worship. They are the best beings to take refuge in and we should offer them our prayers as we can put our full confidence in them. 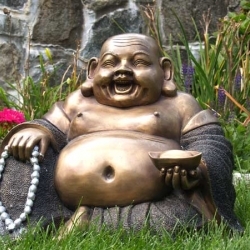 Of all the Buddhas and Bodhisattvas, I personally find that Manjushri is extremely important. This is because what keeps us in samsara (cyclic rebirth) is our total ignorance and misunderstanding of the reality of existence. What is necessary to penetrate this deep ignorance that keeps us bound in a perpetual state of reincarnation is wisdom. We need many types of wisdom which can be acquired by relying on Manjushri as our yidam (meditational deity). By focusing on his meditation, practice, mantra and path we can gain wisdom in order to have the tool to penetrate the reality of existence. Therefore, Manjushri is an extremely important Buddha for us to focus on and take refuge in. Medicine Buddha puja encourages healing of all levels – physical, mental and emotional healing for those in need. 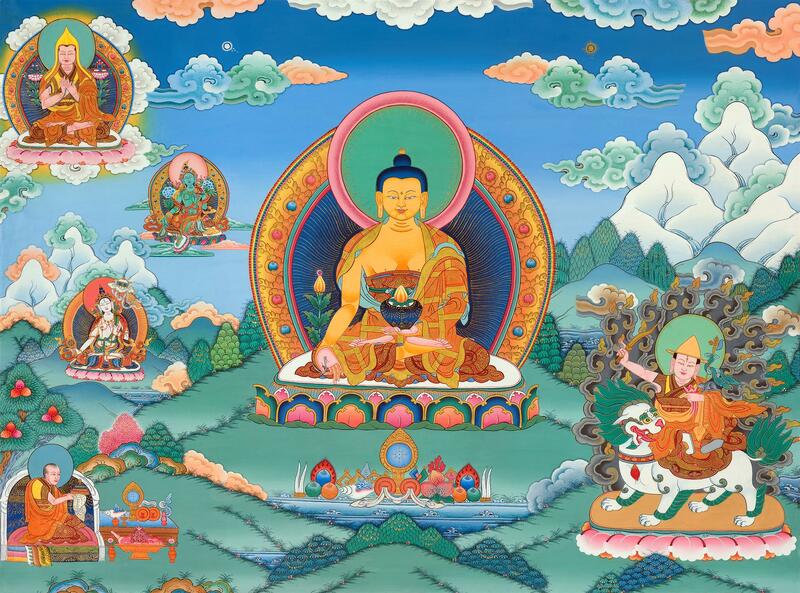 High resolution file of this thangka is available for download for all dharma practitioners around the world and for those who just want sacred images in their environment. Enjoy, be blessed and share this with others. 1. I have met this oracle several times in Dharamsala. She gives very accurate predictions. I have experienced this myself. 2. She is a gentle Yudroma goddess riding on a horse and she is white in color and takes trance quite easily in this official oracle lady that lived in Dharamsala. When you go meet her, you have to bring milk and yogurt. She takes 7 sips of the milk when she first arrives and recites a host of prayers before we can consult her. We have the honor to offer her the milk to gather affinity with her. 3. She, the oracle lady became well known as over several decades ago, a western hiker was lost in the Dharamsala hills. The goddess was consulted via this oracle and Yudroma then correctly told them where to find the hiker and the hiker was found and life saved. After that she became very well known in Dharamsala. 4. 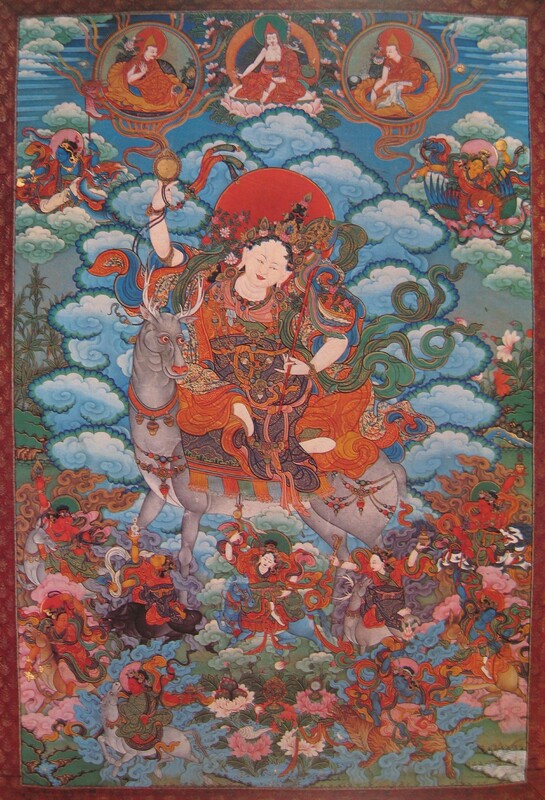 Yudroma the goddess is one of the main protectors of the Gelug Gyuto Tantric Monastery in Dharamsala. 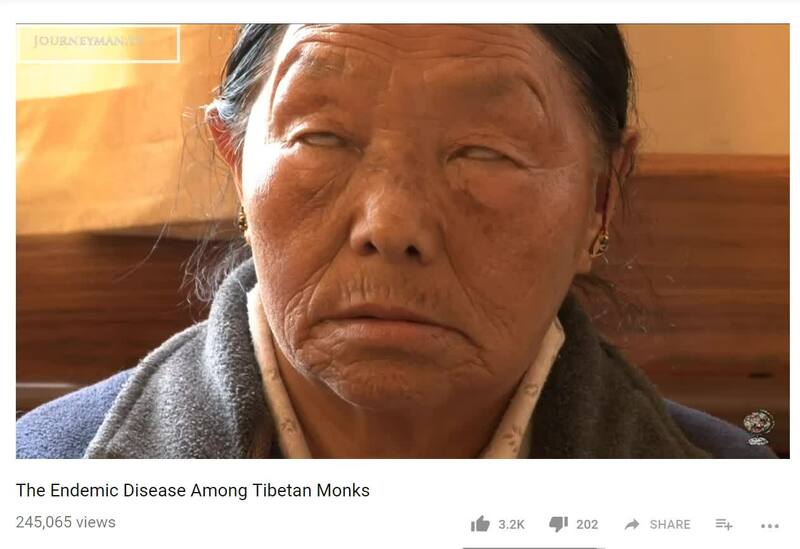 They have relied on her for hundreds of years since Tibet. The monks often ask the lady oracle to take trance and through her consult Yudroma. 5. 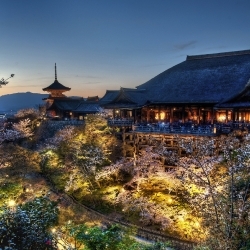 She would be pleased in this video because people are helping Gyuto Monastery, her dominion. Perhaps she is the one that brought the Australian sponsors to help in the first place in her own mystical methods. 6. She is also the protector of Gungru khangtsen in Drepung Gomang monastery in South India. 7. Sadly this lady oracle has passed away and I guess people are perhaps waiting for a new oracle to be chosen by the Yudroma goddess. Haven’t heard anything yet. How lovely this lady served the goddess, monks and monasteries and public through taking trance her whole life. So virtuous of a job. Her body was used to benefit thousands in her lifetime and serve the sangha. I like oracles because humans can meet the gods directly. 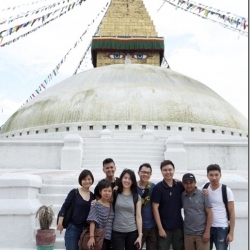 The best we can do with ourselves is to rely on enlightened Dharma protectors one like Dorje Shugden. To rely on mundane protector although oath bound then we are relying on a being that is limited, so at the back of our minds there will be a nagging feeling. It had been a common question asked, the difference between an Enlightened Protector and an Unenlightened Protector. Another question is why in Tibetan Buddhism, there are so many Protectors. The answers are in this article although its contents are specific to the Sacred Yamdrok Yumtso Lake and the Goddess Dorje Geg Kyi Tso. Basically there were many “spirits” and worldly gods who were being revered by Tibetans and these deities were objectionable to the Buddhist teachings that were brought to Tibet by Guru Rinpoche, who subdued them under oath to protect the Buddha Dharma and practitioners. Exciting to read the difference between enlightened and unenlightened Dharma protectors. Thank you Rinpoche and Pastor Niral for the educational information. Thank you Rinpoche and Pastor Niral for this interesting post ! 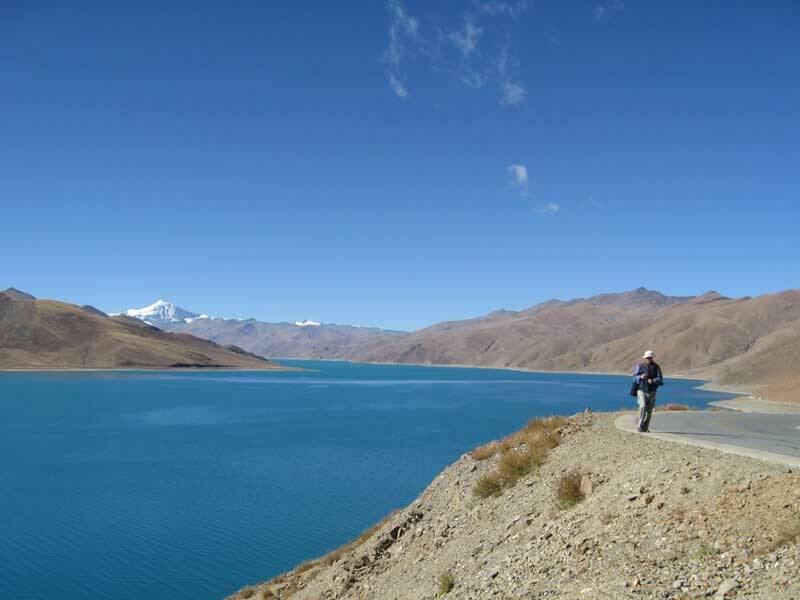 Yamdrok Yumtso Lake is not only a magnificently looking lake, it’s a place of sanctity for many seeking help ! Some of us are brought up in cultures or have been accustomed to certain common family practices which we usually follow blindly not really knowing or understanding why we do them. This might include propitiating wordly help from Gods/deities that we have no real knowledge of. Rinpoche’s advice is most apt to many who are on the lookout for divine assistance to deal with challenges and obstacles in life. Seeking help is common and hence, it’s important to know the reliability/ capability of the source of help. Taking an easy way out by requesting help from non-enlightened beings is not the best option to take . It’s so important to know that these beings might seemed to have “solved” our issues but negative repercussions might happen further down our path as these non-enlightened beings have limited clairvoyance and powers to assists. Interesting! Thank you for sharing this valuable knowledge. I’ve always wanted to know about how the deities become protectors, and the historical information was equally interesting. It’s so mindblowing how Indian and Tibetan holy site co-relate. I’ve always known about Mansarover and this was very welcome news. Spirituality is the same everywhere! Yamdrok Lake – may those who wish to advance in spirituality and whose with highly negative karma have a chance to be led to it! Thank you Rinpoche and Pastor Niral for compiling and sharing the interesting background of the sacred Yamdrok Yumtso Lake in Tibet, which is the manifestation of goddess Dorje Geg Kyi Tso. The story of how the nine separate lakes of Yamdrok Yumtso was combined into one whole lake through the gold offering to all the Buddhas, auspicious prayers and sacred mantras recitation carried out by Yeshe Tsogyal, is full of compassion, kindness and generosity for those living creatures who depend on the lakes for survival. In comparison to our present days, we should help the less fortunate ones, especially those animals whom are being captured as food and thus, we can help the animals by not eating them and become vegetarians. Certainly, there are many ways of helping the animals such as feeding the stray dogs, setting up animals sanctuary and encouraging other people to become vegetarians as well. Upon reading further on this article, it captures my interest that we can purify tremendous of amount of negative karma by completing the circumambulation of the lake within seven days. Besides, the water from this lake Yamdrok Yumtso contains the powerful properties such as healing diseases, granting long-life and increasing one’s intellect which everyone requires for success either in spiritual practice or secular affairs. For those who plan for pilgrimage trip, travelling or vacation, Tibet should be one of the highest choices since there are many sacred and holy sites with full of blessings imbued by many Buddhas, Bodhisattvas, highly attained masters and deities. May all sentient beings able to receive the blessing and protection from Buddhas, Dharma Protector such as Dorje Shugden (Dharma Protector of our time) and the Three Jewels through spiritual practice until samsara ends. Yamdrok Yumtso lake sounds very beautiful and mystical. 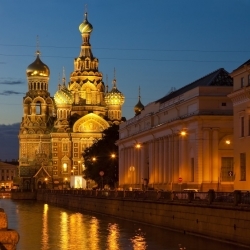 I am always awed by stories of powerful spiritual spaces like this as they represent physical space of goodness, hope, and purity in the midst of samsara. We are truly fortunate that these places still physically exist today and must make effort to preserve them. I believe the continued practice of Dharma by those who visit holy spaces contributes to keeping the magical energy of healing and life extension. 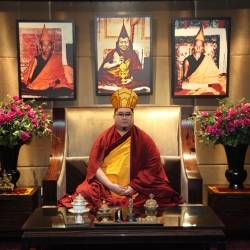 I remember Rinpoche’ teaching on what makes a place holy. 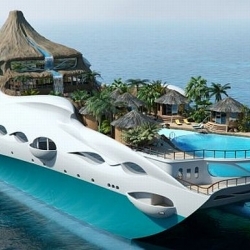 It is very much the motivation and activities that happens continuously and consistently in the space. 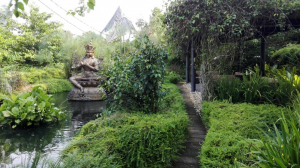 Although Kechara Forest Retreat is a new space with a shorter history relative to Yamdrok Yumtso, magical healing and benefit to visitors have been experienced and witnessed here. This is thanks to the blessings of Rinpoche and high lamas who have visited and conducted powerful ceremonies as well as the individual and group retreat conducted with good motivation. Through the care and effort of Rinpoche, staff members and volunteers may Kechara Forest Retreat continue heal and benefit many more people. Thank you Rinpoche and Pastor Niral for this interesting article. 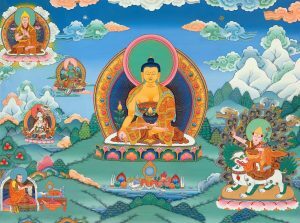 Can you please post the mantra of Dorje Yudronma, Tashi Tseringma and/or the 5 Long-Life Sisters, and/or the mantras of the other Tenma goddesses? I would like to arrange the retinue together.